NTS-6002-GPS-MSF NTP server a professional grade, highly accurate network timing device. The unit synchronises to connected GPS and radio antennas (stongest signal), always providing a secure time server source behind your fire wall. NTS-6002-GPS-MSF - NTP Network Time Server with two independent time sources. 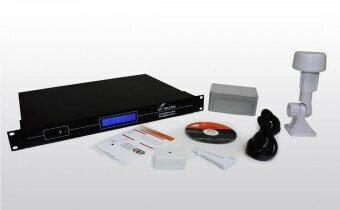 NTS-6002-GPS-MSF Network Time Server combines a GPS receiver and an MSF radio time signal receiver with an embedded Linux solid state computer running and straight forward configuration and management via a web interface. This combination of GPS and radio time sources means that the unit will never be out of synchronisation as it will always take time from the strongest time source. The unit connects directly to your network via a CAT5 Ethernet connection and fits in a standard 19" rack. This NTP server incorporates a GPS and radio-controlled computer clock. The GPS remote antenna tracks up to 12 satellites for increased precision and is fully weather proof (IP65) as it must be installed externally. The radio antenna should preferably also be mounted externally, but can also be mounted internally. The antenna can be mounted up to 1,000m (3,000ft) from the unit using an appropriate (optional) antenna extension kit. The NTS-6002-GPS-MSF has a backlit LCD display to show run-time information for both the GPS subsystem and the NTP server and to aid installation. The Software drivers conform to the Network Time Protocol Version 4 (NTP V4) and are available for uni-cast, broadcast or multi-cast NTP time synchronization. Configuration and management of the unit is straight forward via a network interface. The IP address of the unit can be configured by using DHCP to assigning an IP address automatically or a fixed IP address can be used. The NTS-6002-GPS-MSF has dual Ethernet ports enabling it to serve time to 2 independent networks and can handle more than 250,000 NTP requests per minute per network, making it the first choice for providing accurate time information to large networks with thousands of clients! Ready-to-operate Secure Stratum 1 NTP Time Server. Industry leading 6 Year Warranty. Includes GPS active antenna + MSF radio time signal receiver. Support for NTP v2, NTP v3, NTP v4 and SNTP compatible clients. Configured across network via a secure browser interface by http / html / https (RFC2616). Dual RJ-45 Ethernet interfaces 10/100 MBit. Can handle more than 250,000 NTP requests per minute per port, ideal for large networks. MD5 authentication for advanced security. Able to Peer with other NTP time servers for enhanced synchronization security. Front Panel display for Time and Satellite and Radio time Status. SNTP and NTP protocol support. 1) Primary receiver Active Antenna GPS 12 channel.